Do you ever feel like you didn't get a fair start in life? Your family tree doesn't have the kind of roots you're interested in knowing more about. Ever feel like you'd like to cut your roots and move to a better growing environment? 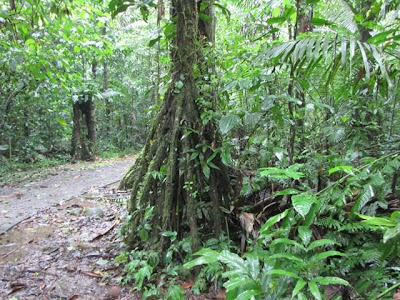 The "walking tree" (Socratea exorrhiza), also known as the "walking palm" or "stilt palm," has a unique ability among trees; it can actually move itself from one place to another. It's a palm that is native to rainforests of tropical Central and South America. 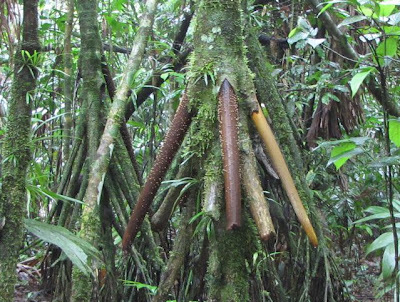 Its common names come from the fact that the tree's stilt roots enable it to slowly shift position, up to more than 3 feet (1 meter) a year, when it desires to change it's location. With the poor quality of the soil in rainforests and the struggle for sunlight amongst plants, this tree has the advantage of being capable of heading towards a more ideal environment for growth. The walking tree forms stilt-like roots which, over time, can provide movement for the tree so it can move out from under fallen trees or towards more light. 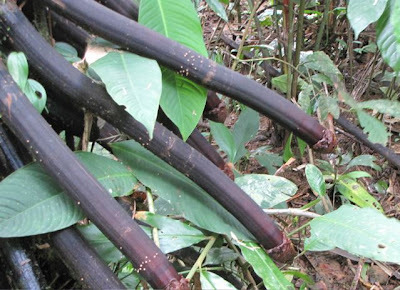 It lacks a central root system, so it will grow in the direction of its preference, allowing the roots to rot on the side that keeps them anchored away from its desired location. Do you see the old roots covered with mosses in the back of the tree? The new roots are bursting forth from the trunk of the tree and reaching for the ground near the trail which has more light. Psychologists, such as Alfred Adler, believe that personality is formed in the first 5 or 6 years of life, and that it's often formed as a direct response to family situations. Certain patterns of behavior work, others do not. Whatever works within the child's family will be repeated and become a personality. For example, some children always get their way by being nice and this trait forms a more sociably acceptable style of life. We know people that are always nice. Other children learn to manipulate their parents or siblings by whining and complaining. If parents give in, the result is a so-called "spoiled child." The resulting adult whines, complains and expects somebody to make things right, while lacking any concern for others. To Adler, the "style of life" was a "habitual social orientation," a distinctive approach to situations involving other people. An individual will tend to be consistently helpful, exploitative, dishonest, ingratiating ... pick your adjective. The style of life tends to be consistent and reflected throughout the individual's life. Sounds kind of permanent, doesn't it? Like what you get is what you got and it's what you'll have until you die. I've heard people say, "That's just the way I am." or "That's me, take it or leave it." Bet you thought once a tree was rooted, it was there for life. 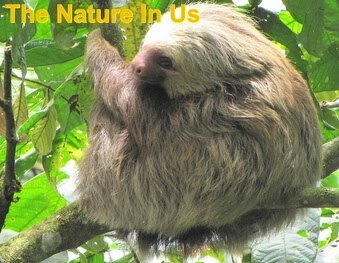 God's Creation shows us many things from which we can gather a visual aid of His provisions for us here on this earth. Those woodland and meadow walks aren't just de-stressing, they'll also give you a closer look at who you are and who God is in you. When we accept Christ as our Savior we are told that we have a new life. We don't have to keep the old "style of life" that we had. We are a new Creation in Christ Jesus (2 Corinthians 5:17). Like the walking palm, we can choose to allow those old roots to whither and die off as we produce new roots that reach for the Light of God. We don't have to act the same old way. We can plant ourselves in better soil and grow more like Christ daily. New roots will bring more nutrition to the body and you will find better physical and mental health with a new outlook of life's possibilities. Jesus gives us plenty of examples of what our new life should look like. We can set our roots down in the Light of His Word and and become rooted and grounded in love. May Paul's prayer encourage you to walk away from the old and turn to the new that is available to you. "I pray that out of his glorious riches he may strengthen you with power through his Spirit in your inner being, so that Christ may dwell in your heart through faith. And I pray that you, being rooted and established in love, may have power, together with all the saints, to grasp how wide and long and high and deep is the love of Christ, and to know this love that surpasses knowledge — that you may be filled to the measure of all the fullness of God. (Ephesians 3:16-19)"